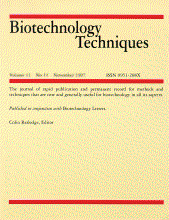 BIOTECHNOLOGY TECHNIQUES is the world's leading rapid-publication primary journal dedicated to biotechnology as a whole - that is, to topics relating to actual or potential applications of biological reactions effected by microbial, plant or animal cells and derived biocatalysts. Any relevant aspects of genetics and cell biochemistry, of process and reactor design, of pre- and post-treatment steps, and of manufacturing or service operations, are therefore included. Contributions from industrial and academic laboratories are equally welcome, and restricted disclosure is acceptable where it does not conflict with clear and useful communication.